Posted on Mon, Feb 6, 2012 : 12:54 p.m.
Domino's Pizza introduced parmesan bread bites to its menu today. Ann Arbor Township-based Domino’s Pizza is rolling out another new product today with the introduction of parmesan bread bites. A Domino’s franchise owner in Findlay, Ohio invented the new menu item, which is being promoted in a national TV ad campaign beginning today. The bread bites are currently available for $1 when ordered with Domino’s two medium, two-topping pizza promotion. The product is available in a 16 or 32 piece order, for $2.99 or $5. 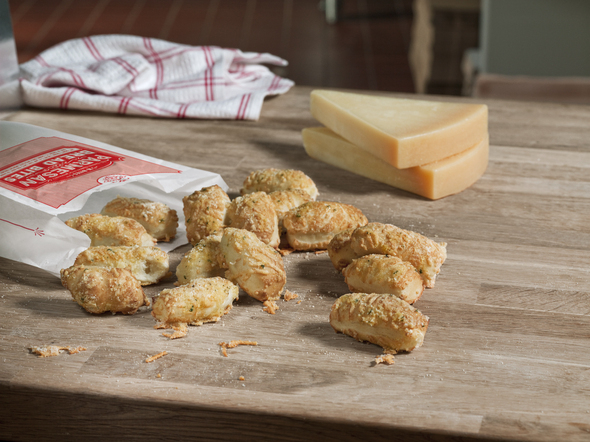 “We have an opportunity with Parmesan Bread Bites to offer extraordinary value, as well as give the entire family something shareable and delicious," said Patrick Doyle, Domino's Pizza president and chief executive officer, in a news release. In recent years, the company has drastically altered its menu offerings, including introducing chicken products, redesigning the pizza recipe, adding artisan pizzas and redeveloping the cheesy bread. The redesigned pizza and an aggressive marketing campaign was credited with driving big sales increases for Domino’s in 2010. Doyle told AnnArbor.com in 2011 that changing the menu was necessary to keep the company viable. As of the third quarter of 2011, Domino’s operated 9,541 franchise and company-owned stores in the U.S. and 70 international markets. Tue, Feb 7, 2012 : 2:27 p.m.
My thoughts exactly, Doug. Both Domino's and Zingerman's seem to get plenty of free advertising through &quot;news&quot; articles in A2.com. Tue, Feb 7, 2012 : 3:22 p.m. It is what it is, you either click the article or move on to the next one. I clicked and so did you so why are you complaining? Tue, Feb 7, 2012 : 3:38 a.m. This is news? Seems more like an advertisement, and it should be labelled as such. Tue, Feb 7, 2012 : 4:32 p.m. It might have something to do with them being in the top 10 largest corporate employers in Ann Arbor, and annarbor.com is a community focused website. Just sayin'. Tue, Feb 7, 2012 : 2:40 a.m.
Tue, Feb 7, 2012 : 12:36 a.m. I was starting to get concerned that we were getting too skinny. I'm not worried any longer. Mon, Feb 6, 2012 : 9:06 p.m. I've been ordering these for at least 3, maybe 6 months? Was the Saline store perhaps a test bed for these? Mon, Feb 6, 2012 : 9:55 p.m. They've been around for a few months, but the actual marketing for them wasn't scheduled to start until today (the day after Super Bowl). Mon, Feb 6, 2012 : 8:55 p.m.
Tue, Feb 7, 2012 : 3:16 p.m.
Mon, Feb 6, 2012 : 10:49 p.m. While not a go-to foodstuff for excellent nutrition, I have seen worse. And the cheese appears to qualify for real cheese, such as it is. See <a href="http://express.dominos.com/shared/base/pdf/nutri-info-cheesybread.pdf" rel='nofollow'>http://express.dominos.com/shared/base/pdf/nutri-info-cheesybread.pdf</a> . Mon, Feb 6, 2012 : 6:59 p.m. Yes! I love that they continue to introduce new products, and those look really tasty.